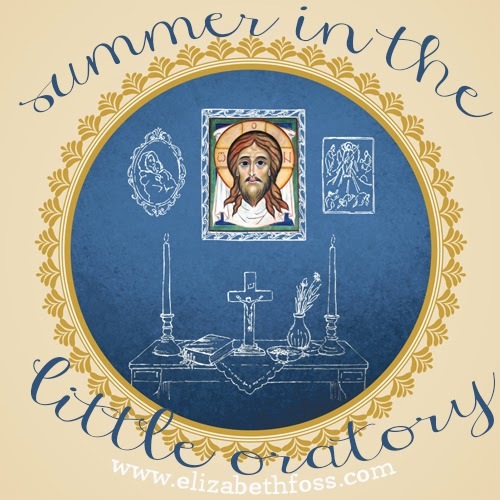 One of the fun things I am doing for myself (and for my family) this summer is the Summer in the Little Oratory book group at Elizabeth's blog. We are reading the book and coming together on Wednesdays to share our thoughts about each chapter. There is also a free podcast with Leila Lawler, one of the authors, that adds much to the reading. This week was the Introduction and Chapter One "The Christian Life". While I was busy reading and underlining this section, my youngest son, Kai, was eagerly looking over my shoulder at the illustrations. 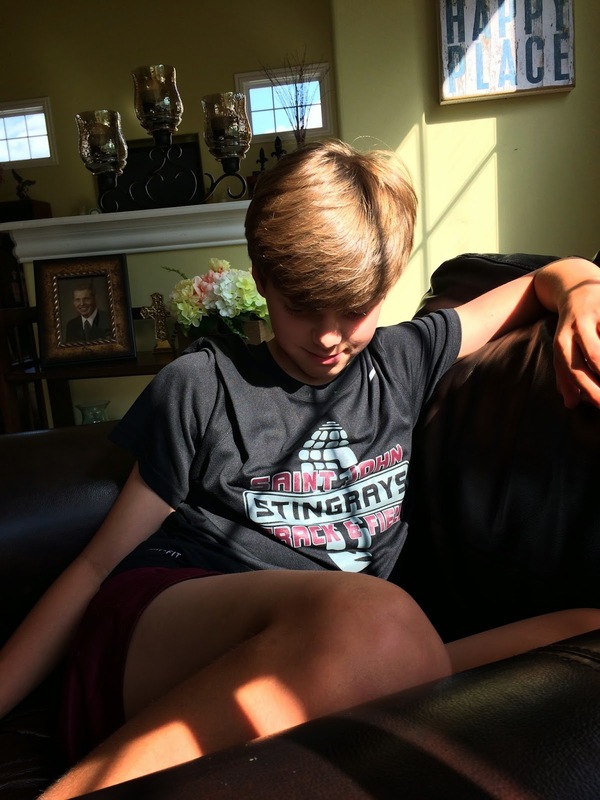 He even took the book with him for the day and paged reverently throughout, gazing at the simple but beautiful black and white drawings which help illustrate the components of creating a little oratory or prayer corner in your home. Kai is now fully on board and eager to create this nook of our own. This is the power of a book with illustrations and I must say, even as an adult, I adore these added details to this book. It's as though I am reading someone's journal where she has jotted images to enhance her ideas. So fun! What I loved most about this section was how the authors described the difficulty converts have in transferring their vast amount of book knowledge, gained through their conversion process, into living a Catholic life in their homes. We converts are on fire and eager to feel, look and be more Catholic and yet, when you have not been raised in a Catholic home, it is so confusing and hard to put one's finger on what that really looks like. I remember being in RCIA class and asking our teacher, "So when do we learn how to do all those really Catholic things like pray the Rosary, celebrate the feast days or ask intercession of the Saints?" My teacher had no specific answers and we never did learn about any of those mysterious practices we newbies had envisioned in our minds that all Catholics just seemed to know. We may have joined the Church at the vigil but felt little more that Protestants attempting to participate in the still quite confusing but most holy Mass. The Christian life is not fully contained in one hour at church each week. That is the highest form of prayer and keeps us united with the body of Christ, but there is also a private side to the Christian life and it encompasses the rest of the week. 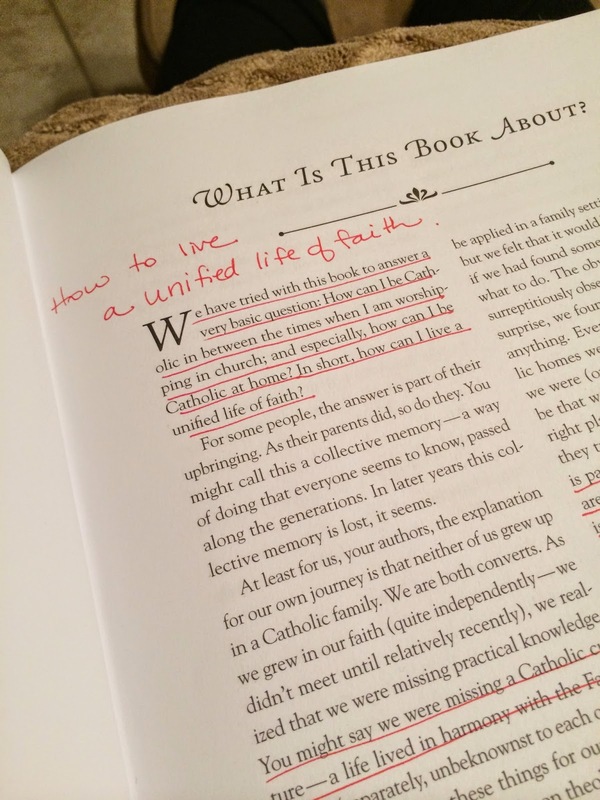 The book is designed to help us live a "unified life of faith", to bring the liturgy home with us and to connect to the body of Christ throughout the day by following the Liturgy of the Hours or Divine Office. It's not that we want a set of rote practices to perform to make us appear Catholic, but rather we yearn to use the traditional practices of the Catholic faith to help us express our love for Christ and to stay in tune with Him and His will throughout the day. I have a sign in our kitchen that says THIS IS MY HAPPY PLACE and that is also the message of this book. The home is our haven and we have the privilege to make it the most inviting, hospitable and safe place for our family and friends to come and find rest. This is my deepest desire for my family, to find our home to be their happy place. This is also the aim of a Christian life. Chapter One refers to Pope Emeritus Benedict's description of the Via Pulchritudinis, or the Way of Beauty. This is the light of joy that flows from a peaceful Christian and spreads to those around him or her. This joy is the result of the inner life of a Christian, the fruit of one's relationship with God in prayer and practice. 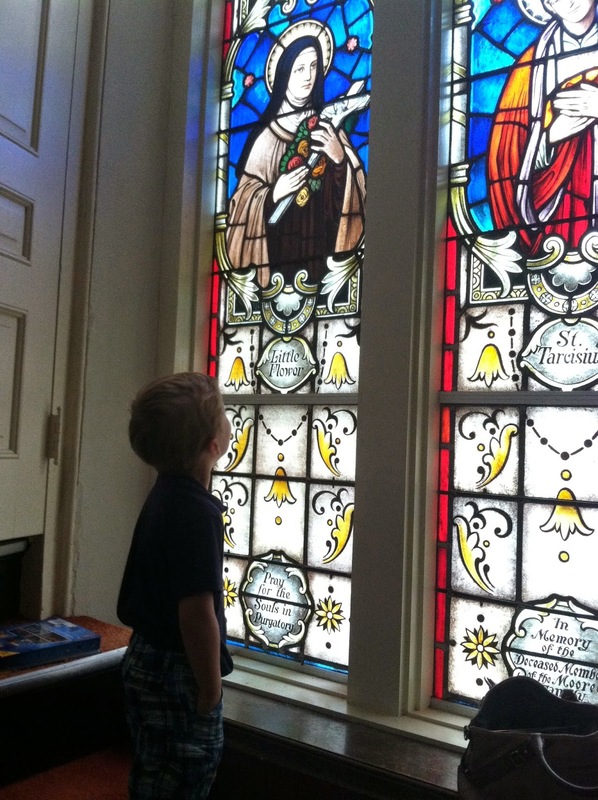 This is the beauty that draws people away from the darkness in the world and into a life of faith. I am excited to read on and find new ways of bringing this peace, joy and light into our home and our daily practices. Lovely post Misty. I've just started reading the book. The thing I'm wrestling with, and maybe because I'm not that far into it yet, is the fact that we have statues and pictures, crucifixes and holy cards all around the house...so how do I go about making one specific corner or do I need one specific spot? I'm guessing the book will answer and in a most reverent and beautiful way. I'm not there yet either Jenny so we can find out together and share how we create our own sacred space. Thank you, Misty, for this thoughtful post! All an author can ask for :) You really get what we're getting at. Thank you! Thank you! I am grateful for your hard work in putting together such a lovely and useful book. It is going to help so many people enrich their lives at home and in their hearts.